The agenda for BlogHer’09 will include some member-programmed sessions under the umbrella “A Room of Your Own,” and the session that I have proposed was one of three featured this week on BlogHer.com. I’d love to see a Room for the book-blogging community: “Book Bloggers: So Many Words, So Little Time.” There’s no guarantee that it will get on to the agenda, though, so I’m asking for your help to make it happen! Please click on that title link to go over and read the description, and if you think it sounds interesting, click the “I would attend this session” link at the top of the post. Voting is anonymous and does NOT commit you to attending, but I’m sure they are looking at interest and potential attendance to determine which sessions will make the cut. (You don’t need to be registered for the conference to vote, but you do have to be a member of the BlogHer community.) Voting will close in mid-May, and 12 sessions will be selected at that time. 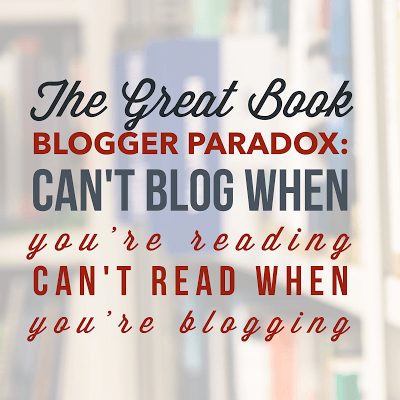 Thanks for your help to get book bloggers on the agenda! Also, if you’re a book blogger who would be interested in playing a bigger role in this session – if it happens – please also click the “I would be interested in presenting on this topic” link. Again, you’re not making a commitment at this point, but if this does happens, I’d really like NOT to do it alone! Oh, and one more thing – if you would be also willing to mention this on your blog with a link to the session page, you would have my tremendous appreciation! How do you balance the “it’s all about me” aspects of blogging with making it interesting and relevant to someone who’s not you? Economic stress –> relationship stress: what about “for richer, for poorer”? You know you want this: directories of book trade people and authors on Twitter (via Bookopolis) – now go out and follow! And what did YOU do today, dear?